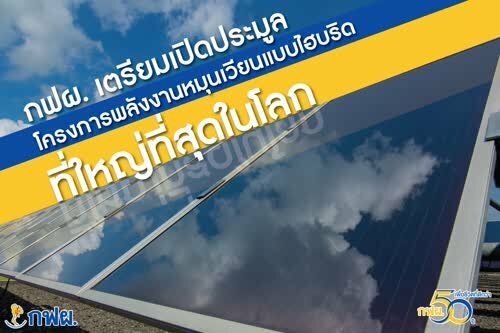 BANGKOK, 20 March 2019 (NNT) - The Electricity Generating Authority of Thailand (EGAT) will open a bidding for a floating solar power plant and hydro power plant in hybrid systems at Sirindhorn dam in May. Energy Minister Siri Jirapongphan said his agency has instructed the EGAT to pursue the 2018 Power Development Plan (PDP) by proceeding with the Hydro-Floating Solar Hybrid power plants at water reservoirs to make a 2,725 megawatt capacity in the next 10 years. The Hydro-Floating Solar Hybrid project will be piloted at Sirindhorn dam with a 45 megawatt capacity, making the facility the world’s largest hybrid power plant to help with the electricity stability and water management efficiency. EGAT Governor Viboon Rerksirathai said the project at Sirindhorn dam will include a floating solar farm on the reservoir, which will generate electricity along with the dam’s hydro power generators and existing electricity converting and delivering facilities. The hybrid power project will improve the stability to the power grid and more flexibility for water management, feeding more electricity to meet daily peak usage period in the evening, reduce reliance on fossil fuel, and reduce the use of farmlands. Solar panels in floating farm will also achieve better efficiency due to low temperature at water surface, while the floating farm itself can serve as a new tourism landmark. Double glass solar panels will be installed on buoys close to the surface, as such type of solar panels is suitable for high humidity and conditions and constant movements. The EGAT will send invitations for the bidding on 15 May 2019, and will accept offers by the end of July 2019. A winning contractor will be announced by the end of October 2019, with the construction expected to commence in January 2020, and commercial power delivery to get started in December 2020. Is this a knock-off of the large floating solar farm in China near the city of Huainan? Maybe to be built by a Thailand-Chinese joint venture. I'd add a couple more. Perhaps a nuclear powered facility hidden in some valley would be to your better liking? Yes, definitely preferable. Just one no maintenance 30mx3m Toshiba 4S reactor module can provide 50MWe (135MWth) with a 30 year fuel cycle.... And generate hydrogen, and desalinate water, all at the same time. Go nuclear, go! the floating farm itself can serve as a new tourism landmark. could be harder ,and more expensive,it's not as though Thailand is short of land. The real benefits are the money to be made during the bidding and construction processes. A friend of mine built a solar plant in the Philippines and sold it on to their govt for millions. Explored the possibility of doing similar in Thailand. "Too many mouths to feed, and too much bureaucracy" was his conclusion. Even Cambodia and Burma were more attractive alternatives and easier to deal with. Fukushima to that mate !..... after 30 years bury the whole thing for 30,000 years before anyone can get near it. Not the same thing at all. And the 30 year fuel cycle means that the remaining fuel will be reused. We are talking Generation 3 here, with sodium cooling and passive safety. Not Gen2 BWR like Fukushima was. Besides, Fukushima reactor design was correct. The location wasn't. As far a maintenance goes, yes I would be a little concerned in Thailand with safety procedures but nothing that could not be implemented. Hydro plants have a bit of water involved. Why can't they use trackers? Funny thing is they use trackers on land which is very much anchored. Lose of elevation. A few meters not going to make any difference. Contamination of drinking water? Possibly but they don't have to be on dams directly connected to drinking water supply. Personally I think its a great idea as this would keep the panels cooler and thus they work more efficiently. With rising global temps the water temps would be lower from all the shading. Not a bad thing. Why? In other topics here on TV, you can read all about the personal traits of Chinese, Russians and Indians. Yet those countries have Nuclear reactors, and also nuclear weapons. (Yes, I know somebody will bring up Chernobyl, a communist era abomination). I personally believe there are Thai professionals capable of running a nuclear power plant. Just like anywhere else in the world. Besides, Generation III and better yet Generation IV reactor designs are low maintenance, more monitoring than active operation, and very long fuel cycles (up to 60 years). The depleted fuel storage requirements are much reduced to only 200-300 years, and much of the currently stored depleted fuel can be reused in some Gen IV designs. One important thing to remember is that there is a requirement to always maintain a base electric power supply. Always on power. Here, the hydro is the "greenest", followed by nuclear, somewhere down the road is coal, and oil and gas are expensive options to fill the peak demands. Personally, I just hate the wind power generator on land, so ugly and noisy. OK on the water. And solar is just not a viable option right now storage wise and power per square meter wise. Unfortunately, there is a stigma associated with nuclear, and there is much scare mongering by the opponents, who unfortunately have not moved forward from the 1970's. That's the main reason why we don't see the latest designs deployed. If fusion power ever looks like becoming a reality, it will be fanatically opposed by the activists of the Green/Left, who regard cheap, reliable energy for everyone as the ultimate nightmare.